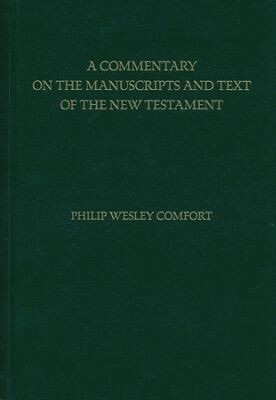 Kregel Publications recently sent me a review copy of Philip Wesley Comfort’s new study resource, A Commentary on the Manuscripts and Text of the New Testament (Get it on Amazon or at CBD. If you are relatively familiar with how pastors and theologians study the Bible, you probably know about commentaries on books of the Bible. Those commentaries provide insights and suggestions on the text of Scripture to help the Bible student know what the texts means, how to teach it, and how to apply it to our lives. That is NOT what this commentary by Comfort is about. This book is a commentary on the manuscripts of the New Testament. In case you did not know it, we do not have the original manuscripts (called the autographs) of the New Testament books that were written by Matthew, Luke, Paul, John, etc. We only have hand-written copies. But we have hundreds (and in some cases, thousands) of copies. 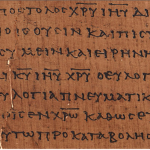 From one perspective, this is a good thing, for the textual evidence of the New Testament is much stronger than any other ancient Greek piece of literature. No other piece of ancient Greek literature has as much textual support as does the New Testament. But here’s the problem: Not all of these copies of the various books of the New Testament agree with each other. There are textual variants in the copies. So the task of the New Testament Greek scholar is to look at the various copies of the New Testament, and try to decide which of the variant readings most likely reflects what Matthew, or Luke, or Paul actually wrote. Then, these “probable” readings get compiled together into our Greek New Testaments today, and it is from these that our English translations are made. Anyway, this new book by Philip Wesley Comfort looks at a large number of the variant readings from the textual families, and briefly explains what the variations are, and what Comfort thinks is the best reading for a particular variant. Comfort’s book, of course, is not the only one like it. 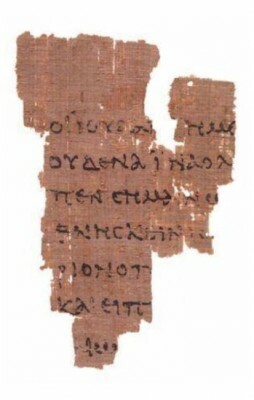 Nearly all Greek New Testaments have a summarized version of this sort of textual commentary in the bottom portion of every page (it is called the Critical Apparatus). In my own study and research, I use two or three other similar tools as well. One tool I have commonly used is very similar to the one Comfort has compiled, and it is A Textual Commentary on the Greek New Testament by Bruce Metzger. So, since I am familiar with that tool, I decided that in the process of reviewing Comfort’s Commentary, I would compare the two. I always knew there were a lot of variants in the Greek manuscripts, but I had forgotten just how many there were. It seems almost every paragraph in the New Testament has a couple. Nevertheless, I sort of assumed that most scholars sort of agreed on what the “major” variants were. But as I compared Comfort with Metzger, I realized that there were lots of variants discussed by Metzger which Comfort ignored, and lots of variants discussed by Comfort which Metzger ignored. Metzger’s volume discussed fewer variants than Comfort, but his discussions are longer and provide more detail about why he chose the variant he did. Comfort, on the other hand, discusses more variants, but his discussions are much shorter, usually only a sentence or two. For that reason alone, you almost need both books. The second thing I noticed is that while Comfort and Metzger agreed a lot of the time on which textual variant is preferred, they disagreed a lot as well. And on some major verses! Take Matthew 12:47 for example. The issue here is whether or not to include the entire verse. Metzger says that it should be included “with brackets” indicating that there is some doubt about whether it is original, whereas Comfort says the best reading is just to omit the verse altogether. There were hundreds of similar such differences of opinion. It used to be that you could trump somebody’s exegesis of the text by saying, “Well, although the English says X, in the Greek it says Y …” But then it began to be that this was no longer good enough, for you had to go back further and say, “Well, although the Greek text you are using says Y, the variant reading from Papyrus 46 says Z, and it is preferable for reasons A, B, and C. But now, Comfort is saying that it is not enough to just know what Papyrus 46 says and why it is preferable for reasons A, B, and C. No, now you also have to understand the tendencies of the guy who was making the copy of the text! So what’s next? Maybe next we will need to know the lighting of the room in which the guy was sitting which caused him not to see the text very clearly, and how he had a fight with his wife that morning, so his mind wasn’t properly focused on his work, and how his ink well had just run dry so he had to get up and get more ink, thus interrupting his attention, and just at that moment, and cat walked sat on his desk (as cats like to do), smudging the work which he had completed, which explains why there is this textual variant in Matthew 12:47. I know, I know. That will never happen. But it made me laugh at how smart we modern people think we are, speaking so confidently about “what the text says,” when we base our opinions off of some dubious rules for “the best reading of the text” (which nobody agrees on anyway, and even if they do agree on the rules, nobody comes to consensus on how to consistently apply them to the textual variants, See p. 30). When Comfort stated that he is making his decisions based on his research into the tendencies of the scribes who produced the texts, it reminded me of the Parable of the Oyster and Ballerinas. I am not criticizing the book. It is an excellent tool. And I am definitely not criticizing textual criticism. We must be thankful for the work of the scholars who have spent their life on this task, for it is only because of them that we have the Bibles we have today. All I am saying is that no matter how much Greek you know, there will always be people who know more than you, and will say that your theology is wrong because you don’t know enough. Even world-class Greek scholars like Comfort “one up” other world-class Greek scholars by saying that the others didn’t understand the tendencies of the scribes who copied the texts. I love studying the Greek (and Hebrew) texts of the Bible. However, I am learning that as important as Greek and Hebrew textual study is, we must not think that the critical study of the text is going to solve all our exegetical and theological dilemmas. It won’t. Here is my answer: Let the scholars have their fun. For it is fun for them. And then, you and I, let’s just read the text that we have, for what else can we do? If you want to know what the Bible says, just study it, read it, pray over it, and ask God to guide you by the Holy Spirit. Most of all, remember always that you have the mind of Christ (1 Cor 2:16), which is way better than knowing whether or not Matthew 12:47 should actually be in your Bible or not. 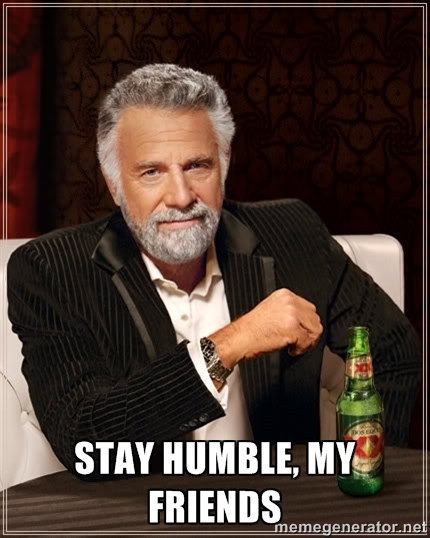 Oh, and here is the #1 rule of Bible interpretation: Stay humble in your conclusions. Scribes and Pharisees still live among us but the truth will always prevail. There is a book out there called Old And Holy, by a fellow named Wood. He claims that the Codex Washingtonienensis (hope I didn’t stick too many “n’s” in that) which just so happens to be kept in the Smithsonian Museum is actually the oldest copy of the New Testament on the planet uncovered so far. Trouble is, no other scholar has agreed with him yet. Wood claims there are notes in the margins that show how this Codex circulated amongst the early churches. They are upside down and in Aramaic. Is that a pic of you generated by one of those age progression programs? Very distinguished look with the salt & pepper hair & beard, and the black satin jacket collar and lapel edges! Ha ha! If the original manuscripts were found, it would put all the Textual Criticism books and scholars out of business. Very disappointed that you have allowed an Alcohol-related commercial to slip into your commentary. The last thing a minister of the Gospel should be doing is giving those who engage in drinking Alcoholic beverages a free ride. More than a little bit disappointed in you Brother Myers. Never mind the excellent article, then. Geez, there’s always one. You need to learn the correct way to offer constructive criticism: offer a compliment, offer your criticism, offer another compliment. Thank you for your comment, which was articulate and clear. It could have done with better punctuation, though, but I did not find that this detracted unduly from the point you were trying to make. And I really appreciate your sense of humour.